Even as the NHL prepares for its season opening on Thursday, Intertops Sportsbook is already taking bets on who’ll wind up with the Stanley Cup in April. The popular online sportsbook, which features wagers on all the US major leagues, heralds the return to the popular North American sport with early NHL odds and a chance to win a trip to the NHL All Star Game. 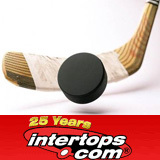 Every dollar wagered at Intertops.com Sportsbook on NHL action earns one entry in a free draw for tickets to the 58th NHL All Star Game in Raleigh, NC in January.